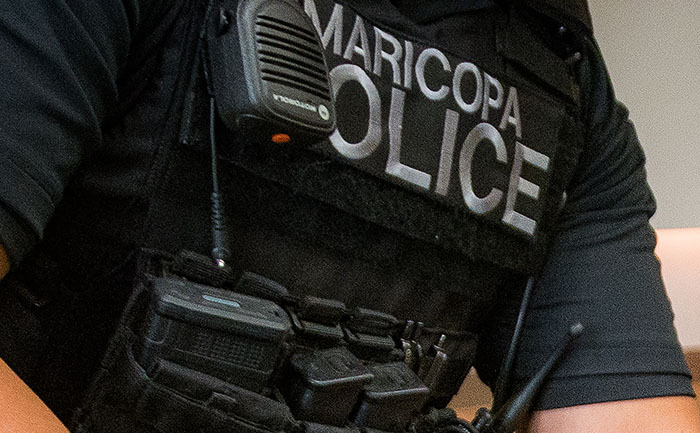 A person has died after being tased in a confrontation with Maricopa Police officers early Saturday morning in the backyard of an Acacia Crossing home. According to MPD, a possible burglary was reported around 3:45 a.m. Officers responded to the 45000 block of Paitilla Lane. A caller reported the breaking of the glass door and told police someone had entered the house. She was told to stay on the phone and confine herself to a restroom for protection. Officers arrived to hear the suspect in the backyard yelling. Police cuffed him and put on leg restraints. Maricopa Fire/Medical Department responded and checked the suspect. According to MPD, the man stopped breathing while MFMD was on scene. He was transported to Chandler Regional Medical Center. He was later pronounced dead by the hospital staff. The individual is described only as a 36-year-old male while the in-custody death is investigated by the Department of Public Safety.